Let the kids turn a plain white t-shirt into a work of art with a soda bottle and fabric paints! Cover cardboard with plastic wrap and insert it inside the t-shirt to stop the paint from transfering from one side to the other. On a large, clean meat tray, pour out some paint in the colors of your choice. Dip the bottom of the soda bottle in the paint. Be sure to get each of one of the sculpted bottle ends in the paint. Now press the bottom of the bottle onto the shirt to make a flower shape. Use a small bottle cap to make the center of the flower. Dip the cap into yellow or orange paint and press into the middle of the flower print. Repeat this process until the t-shirt has as many flower prints as you like. 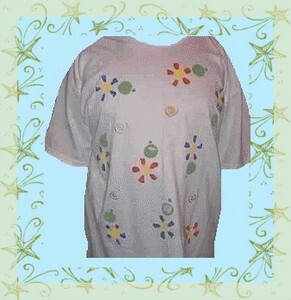 For the leaves we dipped the soda bottle cap in some green paint and pressed it onto the shirt, next to each flower. Dip the pencil eraser into a different color of green and press onto the shirt next to the first circle of green. Use the pipe cleaner to make printed swirls. Just shape the pipe cleaner into a flat spiral, dip in gold paint, and press on the shirt in between the flower prints. You now have a great looking, one-of-a-kind bottle print t-shirt! Turn the t-shirt inside out and ask an adult to heat set your shirt before you wash it.